A wedding is a memorable occasion; it is a day that will be remembered for years to come. Setting up a new home is also a memorable occasion and Banburys recognise that it is important that married life together should start with carefully chosen furnishings and household accessories that will be enjoyed for all those years to come. Banburys wedding list service is a secure on-line service that offers friends and family the opportunity to view a list of specially selected wedding gifts. 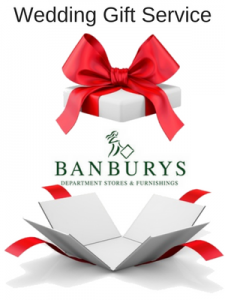 Once a gift has been selected Banburys do the rest; the list is automatically updated to avoid duplication, and gifts are then wrapped and made available for collection. We do not take payment online but if you would like to arrange for a member of our team to contact you and arrange payment and delivery please just ask when submitting your order.